Many a general has led his troops to disaster by getting fixated on shooting at the enemy rather than achieving the strategic objective. Our aim is to get troops delivered to their destination, not rake up notches on our machinegun casing. As attacker, all that matters is getting units to the exits, and not just any units, but the most valuable ones, which means supply trucks, Infantry and to a lesser extent repair/command/ambulance trucks. You will score points for other units, but their main purpose is to blast a hole in the enemy defenses, and to soak up enemy fire. As defender, you need to focus on what the enemy is throwing at you. Pay careful attention to infantry and supply trucks, as they need to be stopped at all costs. Don't forget you can select your defending untis and give them a preferred target during the battle. 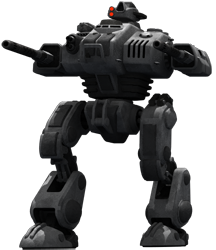 As defender, you can't just place units wherever you like, those turrets need a solid foundation. It might be tempting to slap down big guns right next to the enemy approaches, or cluster them around the exits, but there are some natural 'chokepoints' in many situations where you should focus your fire. A good location for a long-range turret will allow it to focus fire on several different paths, and thus take down more of the dastardly enemy. Pay attention to where you place your long range units. It's no good picking weapons and defenses at random. As you well know, energy-shields were invented to block the impact of dastardly foreign laser-weapons. That means you need to put down ballistic weapons to fight against enemies with shields, and choose laser-weaponary if they come with armor. The difference in weapon effectiveness is huge. If the enemy come at you with waves of infantry, nothing gets the job done better than machineguns and flamethrowers. They will soon have the hun running for cover! Support units are vital. As attacker, you need to include some repair trucks and command trucks to support any mass waves of vehicles, and major infantry assaults will benefit from ambulance support. When defending, you will find that locations for support facilities are hard to find, so make sure you place down the right units. A field hospital surrounded by trenches full of brave troops is an excellent idea, and a carefully placed repair or command center will boost the effectiveness of a cluster of gun emplacements. As commander of attacking troops, it's not enough to just plonk down some units and keep your fingers crossed. These men are trained, but they aren't rocket-scientists, so sometimes you will need to give them instructions mid-battle. If there are multiple paths available you will want to send laser-vehicles and troops along the path that lets them clear out armored units, and make sure you keep units without shields away from enemy lasers. Additionally, you might want to drag-select and issue movement orders to ensure that support units stick with the troops they are supposed to be supporting. These two concepts can make the difference between victory and shameful defeat! As attacker, you will want to keep an eye out for supply drops, and ensure some units are sent to collect them as soon as possible so more will be sent. Supply drops will unlock supply trucks, which can be a quick-and-easy route to victory (as long as you defend them en-route). As defender, keep a close eye on badly depleted enemy infantry platoons. When the last soldier is killed, you might be able to grab his dog tag before it sinks into the mud. The quartermaster collects these, and will reward you with a much-needed supply boost! Tactical tip #9123D : Watch your supply limits! Supplies are always trickling in from HQ, whether you are attacking or defending, but there are many demands on the quartermasters supplies. If you let too much of a supply backlog build up, he will determine that you are adequately supported and thus you will reach your 'supply limit'. At this point you will effectively be wasting potential supplies until you deploy some units. Don't let this happen to you! You need all the forces you can get if you are going to complete your objective and bring an end to the war by christmas!